The suppressive function of regulatory T cells (Treg) is impaired in multiple sclerosis (MS) patients. The mechanism underlying the Treg functional defect is unknown. Treg mature in the thymus and the majority of cells circulating in the periphery rapidly adopt a memory phenotype. Because our own previous findings suggest that the thymic output of T cells is impaired in MS, we hypothesized that an altered Treg generation may contribute to the suppressive deficiency. We therefore determined the role of Treg that enter the circulation as recent thymic emigrants (RTE) and, unlike their CD45RO+ memory counterparts, express CD31 as typical surface marker. We show that the numbers of CD31+-coexpressing CD4+CD25+CD45RA+CD45RO−FOXP3+ Treg (RTE-Treg) within peripheral blood decline with age and are significantly reduced in MS patients. The reduced de novo generation of RTE-Treg is compensated by higher proportions of memory Treg, resulting in a stable cell count of the total Treg population. Depletion of CD31+ cells from Treg diminishes the suppressive capacity of donor but not patient Treg and neutralizes the difference in inhibitory potencies between the two groups. Overall, there was a clear correlation between Treg-mediated suppression and the prevalence of RTE-Treg, indicating that CD31-expressing naive Treg contribute to the functional properties of the entire Treg population. Furthermore, patient-derived Treg, but not healthy Treg, exhibit a contracted TCR Vβ repertoire. These observations suggest that a shift in the homeostatic composition of Treg subsets related to a reduced thymic-dependent de novo generation of RTE-Treg with a compensatory expansion of memory Treg may contribute to the Treg defect associated with MS. Growing evidence suggests a role for natural immunoregulatory T cells of the CD4+CD25+FOXP3+ phenotype (Treg)3 in the prevention of autoimmunity. Numerous studies have reported numeric or functional deficiencies of Treg in various human autoimmune diseases including inflammatory demyelinating disorders of the CNS (Refs. 1, 2, 3, 4, 5, 6, 7, 8, 9, 10 and M. Korporal, M., J. Haas, B. Fritzsching, S. Möller, B. Fritz, C. S. Falk, P. H. Krammer, E. Suri-Payer, and B. Wildemann, Restored suppressive capacities of regulatory T cells under therapy with IFN-β and glatiramer acetate in patients with multiple sclerosis, submitted for publication). We and others have shown that Treg derived from patients with relapsing remitting multiple sclerosis (RRMS) display a functional impairment because they inhibit myelin-specific and Ag-nonspecific T cell proliferation less potently as compared with healthy control donors (Refs. 8, 9, 10 and M. Korporal, M., J. Haas, B. Fritzsching, S. Möller, B. Fritz, C. S. Falk, P. H. Krammer, E. Suri-Payer, and B. Wildemann, submitted for publication). The mechanisms of this Treg defect are unclear. In particular, Treg frequencies in the peripheral blood of multiple sclerosis (MS) patients are unaltered as is their susceptibility to undergoing CD95 ligand-mediated apoptosis (Refs. 8 , 10 , and 11 and M. Korporal, M., J. Haas, B. Fritzsching, S. Möller, B. Fritz, C. S. Falk, P. H. Krammer, E. Suri-Payer, and B. Wildemann, submitted for publication). Treg mature in the thymus and the majority of the cells rapidly adopt a memory CD45RO phenotype (12) when released into the periphery. However, there is recent evidence that small numbers of T cells with a naive CD4+CD25+CD45RA+ surface profile and immunosuppressive properties are detectable within the peripheral Treg pool (13, 14, 15, 16). Unlike their Ag-primed memory counterpart, this naive Treg subset may comprise de novo generated cells that have been recently released from the thymus and have not yet experienced Ag contact. Kimmig et al. have demonstrated that surface expression of CD31 (PECAM-1) on naive CD4+ T cells distinguishes recent thymic emigrants (RTEs) from peripherally expanded naive Th cells (RTE-Th) (17). CD4+CD45RA+RO−CD31+ RTEs, unlike CD45RA+ Th cells lacking CD31, contain high amount of TCR excision circles (TRECs). TRECs are generated as a by-product of the TCR rearrangement process in the thymus and are enriched in newly generated T cells (18). Thus, phenotypic and molecular features define CD4+CD45RA+CD31+ T cells as RTEs and CD4+CD45RA+CD31− T cells as peripherally expanded naive Th cells. As thymic function declines with age the release of RTEs also decreases. This loss of de novo generated Th cells is compensated by peripheral postthymic expansion, resulting in an increase of CD4+CD45RA+CD31− T cell numbers with age (17, 19). This age-related change in the composition of the CD4+ T cell pool may also affect the homeostatic balance and, eventually, the functional properties of Treg. In concordance with this assumption, an age-dependent decline of Treg suppressive potencies has been recently reported in a pilot study (20). Our own previous work suggests that the thymic export function is impaired in MS as levels of TREC-expressing peripheral T cells are significantly decreased in patients with clinically active RRMS in the absence of an accelerated T cell turnover (21). Therefore, we hypothesized that an altered Treg homeostasis may contribute to the suppressive deficiency associated with MS.
To elucidate a potential imbalance in Treg homeostasis in MS, we analyzed the role of naive Treg that coexpress CD31 and circulate in the periphery as RTE. We measured the numbers of RTE-Treg within the peripheral blood of patients with RRMS and healthy persons by multicolor flow cytometry analysis and determined their contribution to the suppressive function of the entire Treg population by in vitro proliferation assays. We also performed CDR3 spectratype analysis to screen Treg derived from both cohorts for differences in the TCR repertoire. Blood specimens were obtained from 40 RRMS patients (mean age 33.9 years, range 14–62 years) as well as from 49 healthy controls (HCs) (mean age 36.7 years, range 24–85 years). All patients had definite MS according to McDonald’s or Poser criteria (22, 23) and had experienced an average number of 1.4 previous relapses (range 0–3). Disease duration ranged between 1 and 5 years (median 2). The mean Expanded Disability Status Scale score was 1.7 (range 1–2). All patients had a clinically active disease and had not yet received treatment with corticosteroids or immunomodulatory agents. The protocol was approved by the University of Heidelberg (Heidelberg, Germany) ethics committee and all individuals gave written informed consent. The mAbs used for flow cytometry were obtained from BD Pharmingen (anti-human CD4, CD45RO, CD45RA, and CD31), Miltenyi Biotech (anti-human CD25), and eBioscience (anti-human FOXP3). FOXP3 staining was performed according to the manufacturer’s protocol. For six-color flow cytometric analysis, cells were first stained with a surface mAb specific for CD4, CD25, CD45RO, CD45RA, or CD31 followed by FOXP3 intracellular staining. FACS acquisition was performed immediately with a FACSCanto cytometer and analyzed with FACSDiva software (BD Biosciences). For the quantification of Treg and Th subsets within peripheral blood, stained PBMCs were first gated on CD4+ cells and than analyzed for the expression of FOXP3 and CD25. Because only CD4+ T cells expressing the FOXP3+ gene product scurfin exhibit suppressive function (24), CD4+CD25+FOXP3+ cells were defined as Treg and CD4+FOXP3− cells as Th (Fig. 1⇓A). Treg and Th cells were further analyzed for their CD45RA/CD45RO surface expression to identify CD45RA−CD45RO+ memory and CD45RA+CD45RO− naive subsets (Fig. 1⇓B). RTE-Treg and RTE-Th were identified by coexpression of the CD31 molecule within the naive Treg and Th subsets (Fig. 1⇓C). Coexpression of CD45RA/CD45RO and CD31 on peripheral Th and Treg. PBMCs were stained with mAbs specific for CD4, CD25, CD45RA, CD45RO, CD31, and intracellular FOXP3 and analyzed by flow cytometry. A typical staining of PBMCs obtained from one healthy donor is shown. A, The dot plot shows the expression of CD25 and FOXP3 on PBMCs gated on CD4+ cells. Treg were identified as FOXP3+ cells and Th as FOXP3− cells. 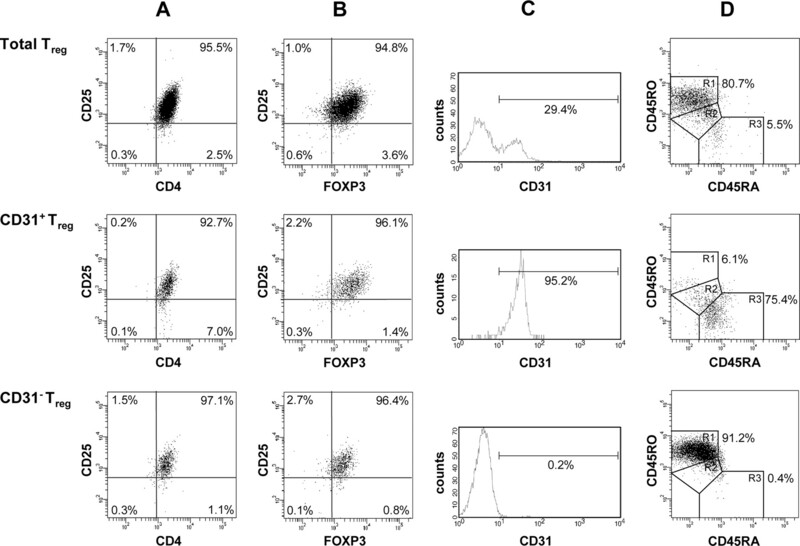 B, Dot plots show CD45RA vs CD45RO expression on FOXP3+ Treg and FOXP3− Th. Memory and naive Th and Treg were defined as CD45RA−CD45RO+ (R1) and CD45RA+CD45RO− (R3), respectively. C, Histograms show CD31 expression on memory and naive Th and Treg. Coexpression of CD31 identifies RTE-Th as CD4+FOXP3−CD45RA+CD45RO−CD31+ cells and RTE-Treg as CD4+FOXP3+CD25+CD45RA+CD45RO−CD31+ cells. PBMC were isolated from 50 ml of peripheral blood by density gradient centrifugation using Ficoll/Hypaque (Biochrom). CD4+ T cells were isolated from PBMCs by using a negative CD4+ T cell isolation kit (Dynal Biotech). CD4+CD25high Treg and CD4+CD25low/CD4+CD25int effector T cells (Teff) were isolated from the pure untouched CD4+ T cells using CD25 magnetic beads (Dynal Biotech). Magnetic beads were removed from Treg using Detachabead CD4 solution (Dynal Biotech). Treg isolated from the PBMC of nine HCs and seven patients were further separated according to their CD31 expression in CD31+ Treg and CD31− Treg by the use of a FITC-labeled anti-CD31 mAb and an anti-FITC MultiSort kit (Miltenyi Biotec). Immune magnetic separation constantly yielded highly pure Treg subsets with >90% CD4+CD25high cells as previously described (Ref. 10 and M. Korporal, M., J. Haas, B. Fritzsching, S. Möller, B. Fritz, C. S. Falk, P. H. Krammer, E. Suri-Payer, and B. Wildemann, submitted for publication). The purity and phenotype of random samples were further tested by intracellular FOXP3 staining that revealed >90% FOXP3+ cells in preparations of total Treg (n = 20, mean 94.7%, range 92.2–98.5% FOXP3+) as well as in CD31+ Treg (n = 7, mean 94.5%, range 90.9–96.1% FOXP3+) and CD31− Treg (n = 11, mean 93.4%, range 93.0–96.4% FOXP3+). Preparations of Treg and Treg subsets isolated from patients and HCs showed similar CD25 and FOXP3 expressions (data not shown). The vast majority of isolated CD31+ Treg expressed CD31 on their surface (mean 96.3%, range 92.4–99.5%), whereas only 4.6% (range 0.2–7.7%) of the CD31-depleted Treg remained CD31+. CD31− Treg exhibited a memory phenotype (mean 82.5%, range 78.3–92.0% CD45RA−CD45RO+). In contrast, CD31+ Treg were predominantly naive (mean 68.5%, range 61.1–75.4% CD45RA+CD45RO−) with <10% memory cells (mean 9.7%, range 5.3–12.7% CD45RA−CD45RO+) (representative examples showing purity and phenotype of isolated Treg subsets are shown in Fig. 2⇓). Purity and phenotype of isolated Treg and Treg subsets. A and B, Immunomagnetically isolated Treg and Treg subsets were stained with mAbs specific for CD4, CD25, CD45RA, CD45RO, CD31, and FOXP3 and analyzed by flow cytometry. A typical staining of Treg subsets immunomagnetically separated from peripheral blood of one healthy donor is shown. More than 92% of isolated Treg, CD31+ Treg, and CD31-depleted Treg were CD4+CD25high (A) and FOXP3-positive (B) and therefore were highly pure. C, Approximately 30% of isolated Treg express CD31 on their surface. After further separation of total Treg into CD31+ and CD31− cells using CD31-labeled microbeads, >95% of the CD31+ fraction but only <1% of the CD31− fraction expressed CD31. D, Dot plots show CD45RA vs CD45RO expression, revealing that purified total Treg are predominantly CD45RA−CD45RO+ memory cells (R1) with only 5–10% naive cells (R3). CD31− Treg also exhibited a memory phenotype with <1% of CD45RA+CD45RO− cells. In contrast, CD31+ Treg were predominantly naive with only <10% memory cells. Freshly isolated Teff (105) were incubated in 96-well plates (Nunc) in 200 μl of culture medium alone or in 4:1 coculture with 2.5 × 104 total Treg or Treg subsets. For TCR stimulation, soluble anti-CD3 (1 μg/ml) and anti-CD28 mAbs (1 μg/ml) were added to the culture medium. After 4 days at 37°C in 5% CO2, 1 μCi of [3H]thymidine per well was added for an additional 16 h. Proliferation was measured using a scintillation counter. Inhibition rate (percentage) of Treg in coculture experiments was defined as [1 − [3H]thymidine uptake (cpm) within a Treg plus Teff coculture ÷ cpm of Teff alone] × 100. Each experiment was performed in triplicate. The CD3 and CD28 mAbs used for cell culture experiments were purified from hybridoma supernatants by protein A affinity purification as described (25). Cell culture medium and mAbs were endotoxin free (<10 pg/ml) as assessed by a Limulus assay (Sigma-Aldrich). Genomic DNA was extracted from 2 × 105 Treg or Treg subsets by the use of a DNAzol solution (Invitrogen Life Technologies) according to the manufacturer’s recommendations. The numbers of TRECs in T cell subsets were determined by real time PCR as described previously (21). Results were expressed as TRECs per 106 cells. We performed CDR3 spectratyping to determine the TCR Vβ repertoire in patient and HC Treg and Teff. Total RNA was isolated from 2 × 105 Treg or 106 Teff using Absolutely RNA Microprep kit (Stratagene) according to the manufacturer’s protocol and converted to cDNA by a SuperScript first-strand synthesis kit (Invitrogen). Amplification of the entire group of 24 TCR V subfamilies was conducted with 24 Vβ-specific primers and one primer recognizing the C region (26, 27). One hundred nanograms of cDNA from each Teff and Treg sample was amplified in eight parallel PCRs each containing a set of three different Vβ primers respectively and the C-primer, which was 6-FAM-labeled for CDR3 spectratyping. Size distribution of fluorescent PCR products was determined by laser-induced capillary electrophoresis using an automated DNA analyzer (A310; Applied Biosystems) and GeneScan software (Applied Biosystems). Normal transcript size distribution consists of eight peaks for each V subfamily (28). Complexity within a V subfamily was determined by counting the number of peaks per subfamily. The complexity score (CS) was calculated as the summation of the scores of all 24 subfamilies. The maximum score would be 192. To determine whether differences and correlations in cell counts, inhibitory capacities, TREC levels, and TCR diversities were statistically significant, we performed the Student’s t test using a two-tailed distribution with unpaired samples and calculated the Pearson’s correlation coefficient. p < 0.05 was considered significant. To determine the number of naive helper T cells that have just entered the circulation as RTEs (RTE-Th), we performed multicolor flow cytometric staining of PBMCs obtained from 28 MS patients and 28 age-matched HCs. RTE-Th frequencies were calculated as percentage of CD45RA+CD45RO−CD31+ cells within total CD4+FOXP3− T cells (Fig. 1⇑). As expected, the proportions of RTE-Th within CD4+FOXP3− cells declined with age in HCs (Fig. 3⇓A). In individuals <30 years of age RTE-Th constituted approximately one-third of CD4+ T cells (mean 28.3%, range 20.9–37.5%). RTE-Th numbers were significantly lower in persons aged 30–45 years (mean 22.0%, range 8.9–33.0%, p = 0.048) and lowest in persons >45 years of age (mean 16.6%, range 6.5–33.4%, p = 0.001). RTE-Th frequencies in patients were significantly lower than those in HCs (MS patients: mean 18.1%, range 3.5–34.6%; HCs: mean 22.7%, range 6.5–37.5%; p = 0.025, Fig. 3⇓A). However, when comparing patients and HCs aged >45 years, the difference was <1% (MS patients: mean 17.1%, range 12.1–29.4%; HCs, mean 16.6%, range 6.5–33.4%; p = 0.905). Similarly, the entire naive Th subset (CD45RA+CD45RO− of CD4+FOXP3− cells) decreased with age in healthy donors but was constantly low in MS patients (data not shown). Conversely, the proportions of memory cells within CD4+ T cells rise with age in HCs (<30 years: mean 38.4%, range 14.6–68.2%; >45 years: mean 68.4%, range 51.0–88.3%; p = 0.002) and are enhanced in MS patients (MS: mean 59.4%, range 39.8–84.3%; HCs: mean 51.0%, range 14.6–88.5%; p = 0.050; Fig. 3⇓B). CD31 expression on memory CD4+ T cells was consistently <10% and did not differ between MS patients and HCs (data not shown). In concordance with numerous studies and our own previous observations, the distribution of total CD4+ T cells was independent of age and unaltered within peripheral blood samples of MS patients (data not shown). Frequencies of naive Th and Treg coexpressing CD31 are age-dependent and reduced in MS. PBMCs obtained from 28 HCs and 28 MS patients were analyzed by multicolor flow cytometry using mAbs specific for CD4, CD25, CD45RA, CD45RO, CD31, and intracellular FOXP3. Dot plots (filled square, MS; gray diamond, HCs) show relative the frequencies of Th and Treg subsets in individual samples. The linear regression curves are shown. Histogram bars (black, MS; gray, HCs) represent mean percentages of Th and Treg subsets in different age groups. A, Percentages of FOXP3−CD45RA+CD45RO−CD31+ cells (RTE-Th) among CD4+ T cells decline with age in HCs and are significantly reduced in younger MS patients (<30 and 30–45 years old). B, Conversely, the relative frequencies of CD45RA−CD45RO+ memory cells within CD4+ T cells rise with age in control donors and are clearly higher in MS patients aged under 30. C, Similar to RTE-Th, the proportions of CD45RA+CD45RO−CD31+ cells within total CD4+FOXP3+CD25+ Treg (RTE-Treg) decrease with age in HCs and are significant higher in younger MS patients, which is paralleled by an increase of CD45RA−CD45RO+ memory Treg in elder HCs and in younger MS patients. Next, we screened peripheral blood samples from 28 MS patients and 28 age-matched HCs for the presence of total Treg and Treg subsets by multicolor flow cytometry. Proportions of RTE-Treg were calculated as percentages of CD45RA+CD45RO−CD31+ cells within total CD4+FOXP3+CD25+ cells (Fig. 1⇑). With regard to total Treg, we observed slightly reduced percentages of CD25+FOXP3+ cells among total CD4+ T cells in MS patients that were not statistically significant (MS: mean 5.0%, range 1.6–9.2%; HCs: mean 5.7%, range 2.6–12.9%; p = 0.107; not depicted). Treg frequencies did not change with age in both patients and HCs (data not shown). In contrast, RTE-Treg frequencies within total FOXP3+ cells declined with age in HCs (all: mean 4.8%, range 0.3–19.5%; <30 years of age: mean 7.2%, range 1.5–19.5%; 30–45 years of age: mean 3.1%, range 0.3–6.1%; >45 years of age: mean 3.2%, range 0.7–6.6%; Fig. 3⇑C). In patients the proportions of RTE-Treg were significantly reduced and not age-associated (all: mean 2.7%, range 0.0–9.8%; <30 years of age: mean 2.6%, range 0.0–5.7%; 30–45 years of ages: mean 3.1%, range 0.4–9.8%; >45 years of age: mean 2.4%, range 0.4–5.9%). Differences in RTE-Treg numbers between MS and HCs were statistically significant for younger persons but were no more detectable in older subjects (<30 years of age: p = 0.034; 31–45 years of age: p = 0.799; >45 years of age: p = 0.348; Fig. 3⇑C). 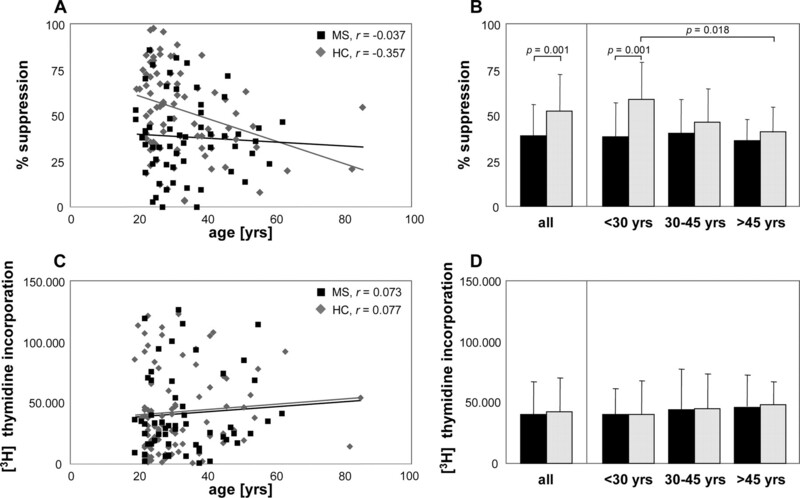 The age-dependent loss of RTE-Treg in HCs is paralleled by a moderate increase of naive Treg lacking CD31 expression (<30 years of age: mean 5.7% of total FOXP3+ cells, range 1.9–23.2%; >45 years of age: mean 8.6%, range 2.5–14.7%, p = 0.115; not depicted). Percentages of CD45RA+CD45RO−CD31− within FOXP3+ cells were also slightly higher in younger MS patients as compared with HCs (MS patients <30 years of age: mean 9.7%, range 0.7–19.4%; p = 0.107; not depicted). Proportions of CD45RA−CD45RO+ memory Treg increased with age in HCs (<30 years of age: mean 60.6%, range 36.4–72.3%; >45 years of age: mean 78.6%, range 64.5–88.5%; p = 0.013; Fig. 3⇑D) and were enhanced in younger MS patients. CD31 expression on memory Treg was consistently low in blood samples of both MS patients and HCs (data not shown). Because TRECs are highly enriched in RTEs (17) as a result of the accomplished TCR gene rearrangement process without further dilution due to proliferation (18), we studied the intracellular levels of TRECs in Treg and Teff subsets isolated from four HCs (mean age 29.0 years, range 26–41 years of age). In concordance with our previous findings (10) total Treg had a very low TREC content (mean 1.6 × 103/106 cells, range 0.8–2.5 × 103/106 cells), suggesting that the Treg pool in the periphery mainly consists of rapidly dividing memory Treg (Fig. 4⇓). As expected, TRECs were virtually absent in the purified CD31− Treg subset predominantly exhibiting a memory phenotype (mean 0.1 × 103/106 cells, range 0.0–0.1 × 103/106 cells). In contrast, mean frequencies of TRECs in CD31+ Treg were substantially higher as compared with the entire Treg population (9.5 × 103/106 cells, range 7.1–11.6 × 103/106 cells; p < 0.001), reflecting the more naive status of this distinct Treg subset. 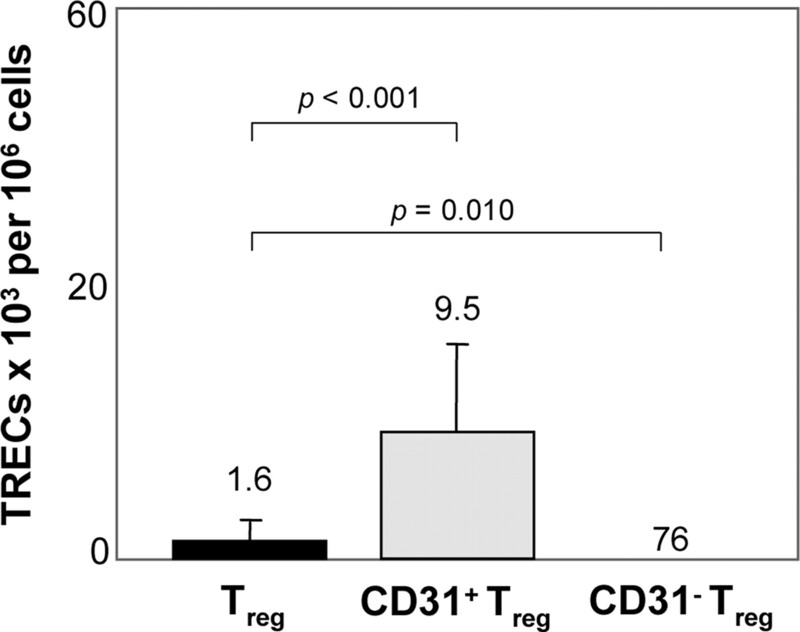 TRECs are detectable in CD31+ Treg but not in CD31− Treg. Intracellular levels of TREC-DNA within Treg subsets isolated from four HCs were determined by quantitative real-time PCR. TRECs were detectable at low levels in total Treg and were virtually absent in CD31− Treg. In contrast, TREC frequencies in CD31+ Treg were substantially higher as compared with the entire Treg population, reflecting a more naive status. Bars represent mean TREC numbers per 106 cells for each Treg subset. We evaluated the data of proliferation assays performed with Treg and Teff isolated from a total of 89 HC donors and 56 patients. Some were from the present study (HCs: n = 18; MS: n = 14), others from subjects included in earlier studies (HCs: n = 71; MS: n = 42). Average ages of the entire cohort were 33.6 years (range 19–62 years; MS) and 32.4 years (range 19–85 years; HCs). All assays were conducted as a 1:4 coculture of 2.5 × 104 Treg with 105 TCR-stimulated autologous Teff and, similarly as in recent reports (Refs. 8, 9, 10 and M. Korporal, M., J. Haas, B. Fritzsching, S. Möller, B. Fritz, C. S. Falk, P. H. Krammer, E. Suri-Payer, and B. Wildemann, submitted for publication), revealed mean Treg-mediated suppressions of 38.4% in MS and 52.0% in HCs (MS: range 0.0–86.4%; HCs: range 4.1–98.4%; Fig. 5⇓B). Interestingly, inhibitory capacities in younger HCs were higher as compared with persons of higher age (<30 years of age: mean 58.4%, range 10.7–98.4%; 30–45 years of age: mean 46.0%, range 3.9–89.5%, p = 0.026; >45 years of age: mean 40.6%, range 21.2–59.6%; p = 0.018; Fig. 5⇓B). Such a decline of suppressive capacity was not seen in patients, who showed the same low suppressive capacity in all age groups (<30 years of age: mean 36.6%, range 0.0–86.4%; 30–45 years of age: mean 41.6%, range 0.0–81.9%; >45 years of age: mean 41.8%, range 8.5–63.7%; Fig. 5⇓, A and B). Differences in Treg-mediated suppression between MS patients and HCs were statistically significant for younger persons but were no more detectable in older subjects (<30 years of age: p = 0.001; 30–45 years of age: p = 0.369; >45 years of age: p = 0.520). In contrast with the Treg-mediated suppression rates, the Teff proliferative responses were not age dependent in HCs and did not differ between MS patients and HCs (Fig. 5⇓, C and D). 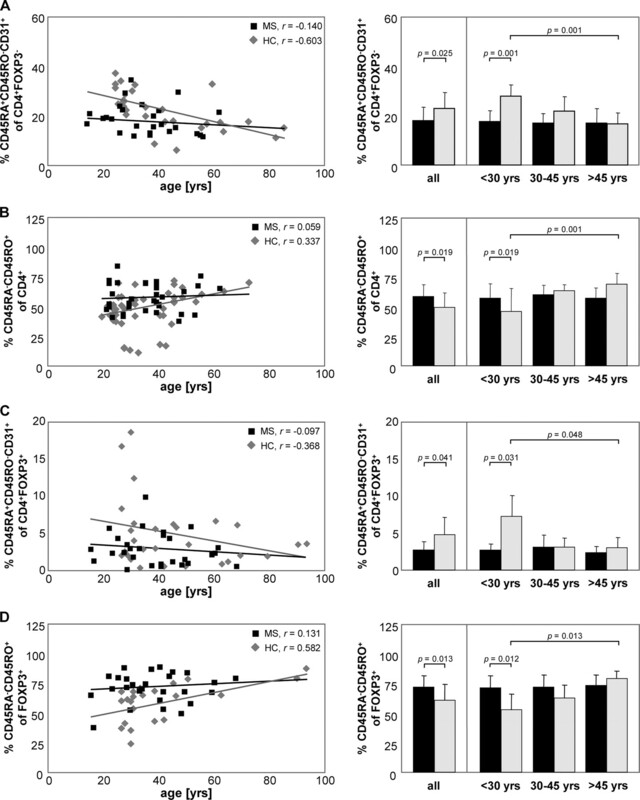 Treg suppressive function is age-associated in healthy individuals. Inhibitory capacities of Treg isolated from peripheral blood samples of 89 HCs and 56 MS patients were determined by in vitro proliferation assays with 1:4 coculture of 2.5 × 104 Treg and 105 TCR-stimulated Teff. A, Dot plots (filled squares, MS; gray diamonds, HCs) show the percentage of suppression in individual samples. The linear regression curves are shown. Treg-mediated suppression declines with age in HCs but not in MS. B, Bars (black, MS; gray, HCs) denote the mean percentage of suppression per age group. Inhibitory capacities differ in the younger MS patients and the HCs but not in subjects of higher ages. C, Filled squares (MS) and gray diamonds (HCs) show Teff proliferation (counts per minute) in individual samples. The linear regression curves demonstrate the age independence of proliferative responses in both HCs and MS patients. D, Bars (black, MS; gray, HC) denote that mean counts per minute also did not differ between different age groups of MS patients and HC. To determine whether the Treg suppressive function correlates with the percentage of cells expressing CD31, we obtained Treg and Treg depleted of CD31+ cells from seven patients (mean age 30.7 years) and seven HCs (mean age 28.7 years). Total Treg and CD31− Treg were tested in parallel in primary in vitro proliferation assays by 1:4 cocultures with 105 TCR-stimulated autologous Teff. As shown above for the entire cohort, again total Treg derived from patients exhibited a reduced inhibitory activity in vitro when compared with Treg isolated from HCs (MS: mean 37.5%, range 19.3–56.1%; HCs, mean 60.0%, range 34.5–83.0%; p = 0.011, Fig. 6⇓A). CD31− Treg obtained from HCs exhibited a less potent inhibitory capacity toward activated Teff with 42.6% (range 8.7–71.8%) suppression only (Fig. 6⇓A). This inhibition rate was comparable to patient-derived CD31− Treg, which inhibited Teff proliferation to the same extent compared with total Treg (38.7%, range 25.9–59.0%; p = 0.837). Prevalence of RTE-Treg within the total Treg population is critical for Treg function. A, Treg and Treg subsets isolated from peripheral blood samples of seven patients and seven HCs were tested in parallel in primary in vitro proliferation assays. Left hand side, Total Treg derived from patients exhibited a reduced inhibitory activity (mean 37.5%, range 19.3–56.1%) when compared with HC Treg (mean 60.0%, range 34.5–83.0%). In contrast, inhibition rates did not differ when using CD31-depleted Treg obtained from the same patients and HCs (MS: mean 38.7%, range 25.9–59.0%; HCs: mean 42.6%, range 8.7–71.8%; right hand side). Thus, the difference in inhibitory potencies of MS Treg and HC Treg, detectable when using total Treg in the coculture experiments, was neutralized by the depletion of CD31+ cells. Bars denote mean percentage of suppression rates for Treg (left hand side) and CD31-depleted Treg (right hand side) obtained in parallel from seven MS patients (black) and seven HCs (gray). B, Percentage of inhibition and percentage of RTE-Treg obtained from six patients and 10 HCs were plotted against each other, revealing clear correlation between Treg suppressive capacities and the prevalence of RTE-Treg. Thus, the difference in inhibitory potencies of patient and HC Treg cells detectable when using total Treg in the coculture experiments was neutralized by the depletion of CD31+ cells. From 16 subjects (MS: n = 6; HCs: n = 10) parallel data from both primary in vitro proliferation assays and multicolor flow cytometry were available. When the percentage of inhibition was plotted against the percentage of RTE-Treg a clear correlation between Treg suppressive capacities and the prevalence of RTE-Treg was obtained (r = 0.553; Fig. 6⇑B). To analyze, whether an altered de novo generation of Treg also influences the Treg clonal distribution, we determined the CDR3 spectratype CS to compare the TCR diversity of Treg from MS patients and HCs (Fig. 7⇓). The mean CS of Treg obtained from 22 HCs was 161 (range 138–185). CDR3 spectratyping of patient-Treg (n = 24) resulted in lower CS values (mean 151, range 101–173). The difference of complexity scores between both study cohorts was statistically significant, with p = 0.041. TCR-diversity of Treg is contracted in MS. TCR-diversity of Treg isolated from 24 MS patients and 22 HCs was determined by CDR3 spectratyping. Mean complexity score of MS Treg was significantly lower as compared with HC Treg, suggesting a restricted clonality of Treg in MS. In previous work, we and others have demonstrated that Treg from MS patients are functionally impaired (Refs. 8, 9, 10 and M. Korporal, M., J. Haas, B. Fritzsching, S. Möller, B. Fritz, C. S. Falk, P. H. Krammer, E. Suri-Payer, and B. Wildemann, submitted for publication). In the present study we provide evidence that the diminished suppressive Treg potencies in MS are related to disequilibrium in the homeostatic composition of circulating Treg and most likely result from an altered thymic release of newly formed T cells into the periphery. Because Treg frequencies in peripheral blood are normal in MS patients as reported in a number of independent studies (Refs. 8, 9, 10 and M. Korporal, M., J. Haas, B. Fritzsching, S. Möller, B. Fritz, C. S. Falk, P. H. Krammer, E. Suri-Payer, and B. Wildemann, submitted for publication) and the susceptibility of patient-derived Treg to undergo apoptotic cell death is also unaltered (11), we wondered whether any imbalance in T cell neogenesis contributes to the Treg defect detectable in MS patients. The rationale to assess this issue in more detail was based on our earlier observation that the thymic export function and the ability to maintain T cell homeostasis is disturbed in MS (21). This may also affect Treg, which is generated in the thymus as a naturally suppressive T cell subset. Kimmig et al. showed that only naive CD4+CD45RA+ cells coexpressing CD31 harbor extrachromosomal deletion circles as traceable molecular markers of newly generated T lymphocytes and phenotypically define RTE (17). The prevalence of CD4+CD45RA+CD31+ cells declines with age, reflecting the thymic-dependent neogenesis of this subset (17, 19). In the present work we confirmed these findings, because the proportion of CD45RA+CD45RO−CD31+ cells within the peripheral CD4+FOXP3− Th pool decreased with age whereas pure CD4+ T cell numbers remained at constant levels. 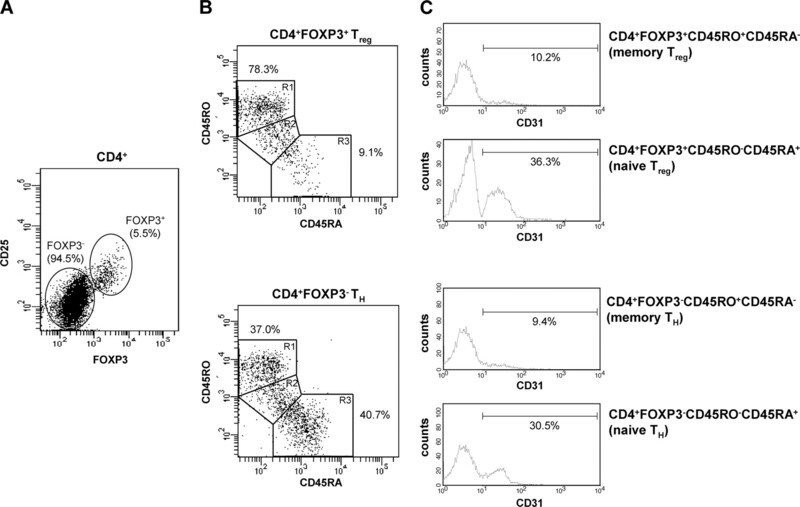 Moreover, the frequencies of CD4+FOXP3−CD45RA+CD45RO−CD31+ cells were significantly decreased in peripheral blood samples of MS patients, thus establishing the presence of an age-inappropriately reduced neogenesis of CD4+FOXP3− Th cells in MS. In concordance with our present and previous results, decreased levels of naive CD4+ T cells in MS were also reported by Crucian et al. (29) and recently by Duszczyszyn and coworkers (30). To demonstrate that the altered Th homeostasis also affects the Treg compartment, we analyzed the CD4+FOXP3+ cells of patient and control-derived PBMCs. In striking contrast to the total Treg quantities that were unaltered in MS, the subpopulation of naive Treg coexpressing CD31 was markedly reduced in patient-derived peripheral blood specimens, with most prominent alterations in younger subjects. This Treg subset encompasses up to 20% of the entire Treg pool and is phenotypically defined by the expression of CD4, CD25, FOXP3, CD45RA, and CD31. CD45RA+CD45RO−CD31+ Treg decline with age in healthy persons and, unlike their CD31− “memory-Treg” counterparts, harbor TRECs. Therefore, they are most likely naive Treg recently released from the thymus and are denoted here as “RTE-Treg.” The reduced de novo generation of RTE-Treg in MS occurred independently of clinical parameters, including an expanded disability status scale score, disease duration, and number of relapses, and was compensated by higher proportions of CD45RA−CD45RO+ FOXP3+ cells resulting in a stable cell count of the total Treg population. This shift from naive toward memory Treg is also detectable in healthy elder individuals. In MS patients the lower levels of RTE-Treg coincide with a moderately contracted Treg TCR Vβ repertoire. Together with our observation that the Treg inhibitory function seems to be reduced in age, which was also reported previously in a small number of healthy individuals (20), this raised the possibility that the prevalence of RTE-Treg critically affects total Treg function. Accordingly, the comparative functional analysis of total Treg and Treg subsets revealed differing suppressive abilities. When assessing immunomagnetically separated total CD25high Treg, we found the expected functional defect in Treg obtained from MS patients. Interestingly, the difference in Treg-mediated suppression between patient and control-derived Treg was totally neutralized when Treg depleted of CD31+ cells were used in the coculture assays. The absence of CD31+ cells markedly reduced the inhibition of T cell proliferation mediated by donor Treg but had no effect on the suppressive function of patient Treg. Overall, there was a clear correlation between Treg-mediated suppression and the prevalence of RTE-Treg within the Treg pool. Taken together, this clearly indicates that CD31-expressing naive Treg contribute to the functional properties of the entire Treg population and further illustrates the obvious lack of RTE-Treg in MS patients. Fritzsching et al. recently reported that human naive Treg are less sensitive to apoptotic cell death as compared with conventional Treg and suggested that naive Treg are in an earlier state of differentiation whereas “classic” memory Treg represent fully mature suppressor cells, which can be easily eliminated by apoptotic signals from conventional T cells (16). Moreover, in vitro expansion of human naive Treg, but not memory Treg, generates fully suppressive Treg clones as recently demonstrated (31). Therefore, although it seems counterintuitive, it is possible that also in vivo the naive or especially the CD31+CD45RA+ Treg compartment exerts the most effective suppression. In contrast, preactivated Treg might be exhausted, prone to apoptosis, and less effective in suppression. This idea should be addressed in additional experiments in murine models. Thus, we claim, that CD45RA+CD45RO−CD31+ Treg represent a group of immature, natural regulatory T cells recently released from the thymus that are characterized by normal suppressive potential and insensitivity against apoptotic elimination. A constant supply of RTE-Treg may be essential to compensate exhausted or eliminated memory Treg and to maintain full inhibitory capacity of the entire Treg compartment. Any down-regulation of RTE-Treg release in the context of physiological thymic atrophy or pathological processes may impair Treg homeostasis in the periphery and is likely to promote alterations in Treg function in magnitudes that are detectable in elderly individuals and also in MS patients. Concordant with homeostatic shifts within the Treg subset, Vukmanovic-Stejic et al. recently described a population of short-lived memory Treg induced from primed/memory CD4+CD25− T cells in the periphery that, via rapid peripheral turnover, is responsible for the maintenance of Treg numbers during aging (32). The reconstitution of Treg homeostasis either by adoptive transfer of naive Treg or by modulation of thymic function should have the potential to restore the impaired Treg suppressive capacities in MS patients back to normal levels. We have recently shown that prolonged treatment of MS patients with glatiramer acetate (GA) and IFN-β restores Treg function via a direct targeting of the Treg compartment (M. Korporal, M., J. Haas, B. Fritzsching, S. Möller, B. Fritz, C. S. Falk, P. H. Krammer, E. Suri-Payer, and B. Wildemann, submitted for publication). In addition to their anti-inflammatory effects (33, 34), immunomodulatory drugs, including GA, up-regulate numbers of naive T cells in MS patients (35, 36). Our own preliminary data indicate that RTE-Treg numbers increase under GA treatment (data not shown) and possibly suggest a direct effect of this agent on thymic function. Therefore, we believe that pharmacologic modulation of the thymus and the reconstruction of peripheral Treg homeostasis may trigger the augmentation of Treg inhibitory capacities and may be a promising treatment strategy in MS and other autoimmune disorders. ↵1 This work was supported by the Gemeinnützige Hertie-Stiftung (1.01.1/04/003), Deutsche Forschungsgemeinschaft (Sonderforschungsbereich (SFB) 405, 5H and SFB 571, B7), the Young Investigator Award from the Faculty of Medicine, University of Heidelberg (to B.F.), and Serono Deutschland GmbH. ↵3 Abbreviations used in this paper: Treg, regulatory T cell; CS, complexity score; GA, glatiramer acetate; HC, healthy control; MS, multiple sclerosis; RRMS, relapsing remitting MS; RTE, recent thymic emigrant; Teff, effector T cell; TREC, TCR excision circle. Kukreja, A., G. Cost, J. Marker, C. Zhang, Z. Sun, K. Lin-Su, S. Ten, M. Sanz, M. Exley, B. Wilson, et al 2002. Multiple immunoregulatory defects in type-1 diabetes. J. Clin. Invest. 109: 131-140.
de Kleer, I. M., L. R. Wedderburn, L. S. Taams, A. Patel, H. Varsani, M. Klein, W. de Jager, G. Pugayung, F. Giannoni, G. Rijkers, et al 2004. CD4+CD25bright regulatory T-cells actively regulate inflammation in the joints of patients with the remitting form of juvenile idiopathic arthritis. J. Immunol. 172: 6435-6443. Crispin, J. C., A. Martinez, J. Alcocer-Varela. 2003. Quantification of regulatory T-cells in patients with systemic lupus erythematosus. J. Autoimmun. 21: 273-276. Boyer, O., D. Saadoun, J. Abriol, M. Dodille, J. C. Piette, P. Cacoub, D. Klatzmann. 2004. CD4+CD25+ regulatory T-cell deficiency in patients with hepatitis C-mixed cryoglobulinemia vasculitis. Blood 103: 3428-3430. Kriegel, M. A., T. Lohmann, C. Gabler, N. Blank, J. R. Kalden, H. M. Lorenz. 2004. Defective suppressor function of human CD4+CD25+ regulatory T-cells in autoimmune polyglandular syndrome type II. J. Exp. Med. 199: 1285-1291. Sugiyama, H., R. Gyulai, E. Toichi, E. Garaczi, S. Shimada, S. R. Stevens, T. S. McCormick, K. D. Cooper. 2005. Dysfunctional blood and target tissue CD4+CD25high regulatory T-cells in psoriasis: mechanism underlying unrestrained pathogenic effector T-cell proliferation. J. Immunol. 174: 164-173. Viglietta, V., C. M. Baecher-Allan, H. L. Weiner, D. A. Hafler. 2003. Loss of functional suppression by CD4+CD25+ regulatory T-cells in patients with multiple sclerosis. J. Exp. Med. 199: 971-979. Venken, K., N. Hellings, K. Hensen, J.-L. Rummens, R. Medaer, M. B. D’hooghe, B. Dubois, J. Raus, P. Stinissen. 2006. Secondary progressive in contrast to relapsing-remitting multiple sclerosis patients show a normal CD4+CD25+ regulatory T-cell function and FOXP3 expression. J. Neurosci. Res. 83: 1432-1446. Haas, J., A. Hug, A. Viehöver, B. Fritzsching, C. S. Falk, A. Filser, T. Vetter, L. Milkova, M. Korporal, B. Fritz, et al 2005. Reduced suppressive effect of CD4+CD25high regulatory T-cells on the T-cell immune response against myelin oligodendrocyte glycoprotein in patients with multiple sclerosis. Eur. J. Immunol. 35: 3343-3352. Fritzsching, B., M. Korporal, J. Haas, P. H. Krammer, E. Suri-Payer, B. Wildemann. 2006. Similar sensitivity of regulatory T cells toward CD95L-mediated apoptosis in patients with multiple sclerosis and healthy individuals. J. Neurol. Sci. 251: 91-97. Baecher-Allan, C., J. A. Brown, G. J. Freeman, D. A. Hafler. 2001. CD4+CD25high regulatory cells in human peripheral blood. J. Immunol. 167: 1245-1253. Kleinewietfeld, M., F. Puentes, G. Borsellino, L. Battistini, O. Rotzschke, K. Falk. 2005. CCR6 expression defines regulatory effector/memory-like cells within the CD25+CD4+ T-cell subset. Blood 105: 2877-2886. Valmori, D., A. Merlo, N. E. Souleimanian, C. S. Hesdorffer, M. Ayyoub. 2005. A peripheral circulating compartment of natural naive CD4 Tregs. J. Clin. Invest. 115: 1953-1962. Seddiki, N., B. Santner-Nanan, S. G. Tangye, S. I. Alexander, M. Solomon, S. Lee, R. Nanan, St. Fazekas, B. Groth. 2006. Persistence of naive CD45RA+ regulatory T cells in adult life. Blood 107: 2830-2838. Fritzsching, B., N. Oberle, E. Pauly, R. Geffers, J. Buer, J. Poschl, P. H. Krammer, O. Linderkamp, E. Suri-Payer. 2006. Naive regulatory T cells: a novel subpopulation defined by resistance towards CD95L-mediated cell death. Blood 108: 3371-3378. Kimmig, S., G. K. Przybylski, C. A. Schmidt, K. Laurisch, B. Mowes, A. Radbruch, A. Thiel. 2002. Two subsets of naive T helper cells with distinct T cell receptor excision circle content in human adult peripheral blood. J. Exp. Med. 195: 789-794. Hazenberg, M. D., M. C. Verschuren, D. Hamann, F. Miedema, J. J. van Dongen. 2001. T cell receptor excision circles as markers for recent thymic emigrants: basic aspects, technical approach, and guidelines for interpretation. J. Mol. Med. 79: 631-640. Gomez, I., U. Hainz, B. Jenewein, S. Schwaiger, A. M. Wolf, B. Grubeck-Loebenstein. 2003. Changes in the expression of CD31 and CXCR3 in CD4+ naive T cells in elderly persons. Mech. Ageing Dev. 124: 395-402. Tsaknaridis, L., L. Spencer, N. Culbertson, K. Hicks, D. LaTocha, Y. K. Chou, R. H. Whitham, A. Bakke, R. E. Jones, H. Offner, et al 2003. Functional assay for human CD4+CD25+ Treg cells reveals an age-dependent loss of suppressive activity. J. Neurosci. Res. 74: 296-308. Hug, A., M. Korporal, I. Schröder, J. Haas, K. Glatz, B. Storch-Hagenlocher, B. Wildemann. 2003. Thymic export function and T cell homeostasis in patients with relapsing remitting multiple sclerosis. J. Immunol. 171: 432-437. McDonald, W. I., A. Compston, G. Edan, D. Goodkin, H. P. Hartung, F. Lublin, H. F. McFarland, D. W. Paty, C. H. Polman, S. C. Reingold, et al 2001. Recommended diagnostic criteria for multiple sclerosis: guidelines from the International Panel on the diagnosis of multiple sclerosis. Ann. Neurol. 50: 121-127. Poser, C. M., D. W. Paty, L. Scheinberg, W. I. McDonald, F. A. Davis, G. C. Ebers, K. P. Johnson, W. A. Sibley, D. H. Silberberg, W. W. Tourtellotte. 1983. New diagnostic criteria for multiple sclerosis: guidelines for research protocols. Ann. Neurol. 13: 227-231. Schmitz, I., H. Weyd, A. Krueger, S. Baumann, S. C. Fas, P. H. Krammer, S. Kirchhoff. 2004. Resistance of short term activated T cells to CD95-mediated apoptosis correlates with de novo protein synthesis of c-FLIPshort. J. Immunol. 172: 2194-2200. Genevee, C., A. Diu, J. Nierat, A. Caignard, P. Y. Dietrich, L. Ferradini, S. Roman-Roman, F. Triebel, T. Hercend. 1992. An experimentally validated panel of subfamily specific oligonucleotide primers (Vα 1-w29/Vβ 1-w24) for the study of human T cell receptor variable V gene segment usage by polymerase chain reaction. Eur. J. Immunol. 22: 1261-1269. Choi, Y. W., B. Kotzin, J. Herron, J. Callahan, P. Marrack, J. Kappler. 1989. Interaction of Staphylococcus aureus toxin superantigens with human T cells. Proc. Natl. Acad. Sci. USA 86: 8941-8945. Gorski, J., M. Yassai, X. Zhu, B. Kissella, C. Keever, N. Flomenberg. 1994. Circulating T cell repertoire complexity in normal individuals and bone marrow recipients analyzed by CDR3 size spectratyping: correlation with immune status. J. Immunol. 152: 5109-5119. Crucian, B., P. Dunne, H. Friedman, R. Ragsdale, S. Pross, R. Widen. 1995. 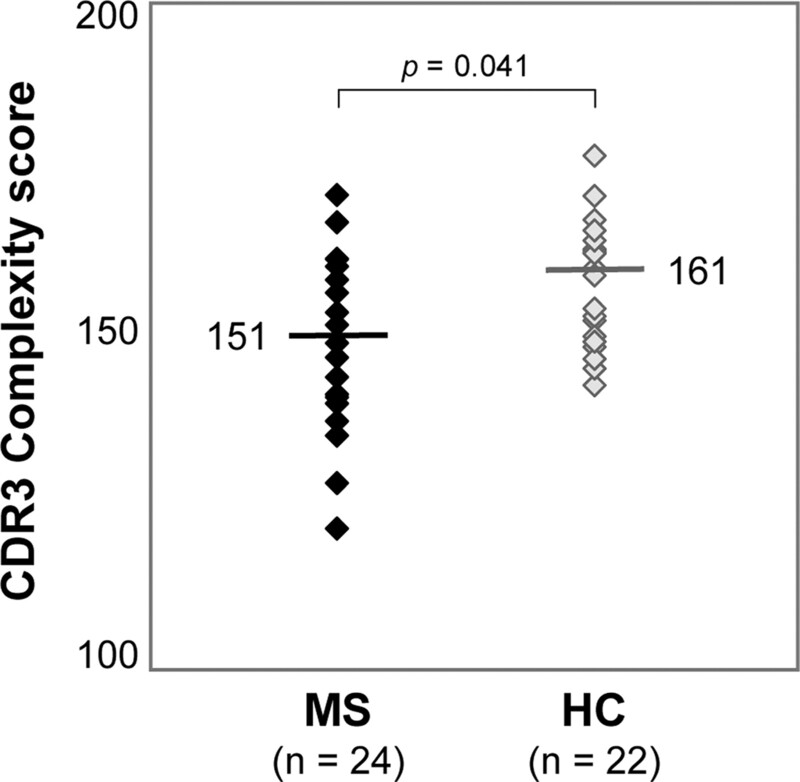 Alterations in levels of CD28−/CD8+ suppressor cell precursor and CD45RO+/CD4+ memory T lymphocytes in the peripheral blood of multiple sclerosis patients. Clin. Diagn. Lab. Immunol. 2: 249-252. Duszczyszyn, D. A., J. D. Beck, J. Antel, A. Bar-Or, Y. Lapierre, V. Gadag, D. D. Haegert. 2006. Altered naive CD4 and CD8 T cell homeostasis in patients with relapsing-remitting multiple sclerosis: thymic versus peripheral (non-thymic) mechanisms. Clin. Exp. Immunol. 143: 305-313. Hoffmann, P., R. Eder, T. J. Boeld, K. Doser, B. R. Piseshka, A. Andreesen, M. Edinger. 2006. Only the CD45RA+ subpopulation of CD4+CD25high T cells gives rise to homogeneous regulatory T cell lines upon in vitro expansion. Blood 108: 4260-4267. Vukmanovic-Stejic, M., Y. Zhang, J. E. Cook, J. M. Fletcher, A. McQuaid, J. E. Masters, M. H. Rustin, L. S. Taams, P. C. Beverley, D. C. Macallan, A. N. Akbar. 2006. Human CD4+ CD25hi FOXP3+ regulatory T cells are derived by rapid turnover of memory populations in vivo. J. Clin. Invest. 116: 2423-2433. Hartung, H. P., A. Bar-Or, Y. Zoukos. 2004. What do we know about the mechanism of action of disease-modifying treatments in MS?. J. Neurol. 251: v12-v29. Zhang, J., G. Hutton, Y. Zang. 2002. A comparison of the mechanisms of action of interferon β and glatiramer acetate in the treatment of multiple sclerosis. Clin. Ther. 24: 1998-2021. Lehmann, D., D. Karussis, R. Mizrachi-Koll, A. S. Linde, O. Abramsky. 1997. Inhibition of the progression of multiple sclerosis by linomide is associated with upregulation of CD4+/CD45RA+ cells and downregulation of CD4+/CD45RO+ cells. Clin. Immunol. Immunopathol. 85: 202-209. Blanco, Y., E. A. Moral, M. Costa, M. Gomez-Choco, J. F. Torres-Peraza, L. Alonso-Magdalena, J. Alberch, D. Jaraquemada, T. Arbizu, F. Graus, A. Saiz. 2006. Effect of glatiramer acetate (Copaxone((R))) on the immunophenotypic and cytokine profile and BDNF production in multiple sclerosis: A longitudinal study. Neurosci. Lett. 406: 270-275.